Simply Beautiful: Louis Vuitton! Are you Serious?? Would you pay $2,000 for a LV bag that looks like this? Well, I don't own one LV bag to my name, nor will I have one any time soon. (maybe in the future..hehe) But come on, is this like the new thing to fashion bags? FASHION TRASH BAGS? Don't give up on me LV! Keep up with your signature bags that maybe one of these days I may be able to cough up enough money to own one of them. But $2G's for this? I may just give up and *pause*....go to the next brand down the road. Supposedly these are waterproof bags with leather strap and strawstring neck tie. Oooh soo exciting! 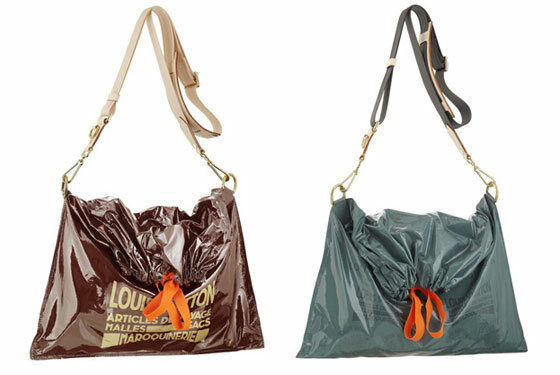 So what do you think of these Fashion Forward new LV bags? Omg! that is a horrible purse design. Honestly, I don't think I'd even pay $10 for that. The handle is okay, but gosh, the trash bag is dispictable. I'm pretty sure that this is some horrible scam. Seriously. That needs to be released on April Fools day as some twisted joke. Yes, I agree with all you ladies..and going with what shopnchop said..just say NO! WTH?! Can we say EW! I guess it's nice that it's waterproof but come on... $2Gs for this is unbelievable. they're just taking advantage of their reputation. two thumbs WAY down! omg... wooowwww.... no way. they are crazy! can't afford to buy LV but if i'm super rich i will not buy those. my friend's fake LV is better looking than those, lol. Ew! Definitely would not! That looks like CRAP! I'd love to own one of those louis vuitton monogram bags though =]!